Not being the biggest fan of the post-apocalyptic setting in most media, volume 1 of Girls’ Last Tour does at least make the idea more serviceable and delightful. The premise follows Chito and Yuuri, two girls exploring the aftermath of some catastrophic and cataclysmic event leaving the world in ruin and more importantly, the two seemingly to be the last ones alive. With the manga being more slice-of-life and philosophical rather than survival horror as you might initially think it does strike a nice balance between picturesque humorous moments and those that offer some light food for thought on everything from the nature of war to life itself. However, with most chapters being rather short and more akin to a 4 panel comic, you tend to get more slice-of-life and humor from the girls than philosophy which tends to be more of a pleaser for any audience. As far as the adventures in this volume go, the chapters are broken into stand alone vignettes which see girls visiting an abandoned outpost, enjoying a hot bath after a snowstorm, and even running across their first contact with another survivor among other things. However, by judging the end of the chapter, that fellow might be a one-time appearance. At any rate, the vignettes on their own where pretty interesting for setting up the world as well as what the reader can expect. The only problem I did have was with how nondescript the setting is, but feel like the next volume will provide some more insight. In terms of artwork, Girls’ Last Tour is very minimalistic in its approach, yet gets the point across. With the simplest designs being Chiito and Yuuri themselves, it is quite easy to get attached to them or even be in awe in the sharp contrast to some of the beautiful discovers they unearth. Besides the environment and characters, it is worth noting that the vehicle the two use for transportation dubbed the Kettenkrad was designed by Takaai Suzuki, the same that worked on the direction of Strike Witches and Girls und Panzer as its military historian. Definitely an interesting tidbit of information for those that like the aforementioned titles. With the debut of Chito and Yuuri travels getting off to a light start, I can’t say that I am completely sold on this series, but liked what I experienced so far. Although, given the nature of the series and its calming atmosphere, I wouldn’t mind dropping in for the next leg of the trip while taking in the vistas and visages that Chito and Yuuri stumble upon. Pros: Different setting for a slice-of-life themed title, self-contained vignettes mix humor with some poignant moments, art style and presentation. Cons: Not much detail or hard to grasp the setting. Final Verdict: The introductory volume of Girls’ Last Tour is a light and nothing of consequence read that is about as slice-of-life as you can get, but in an unexpected setting. If you’re looking for a refreshing take on the genre or wanting to transform a tempest of a day into a relaxing lull then this manga will probably serve you well. I mostly agree with you. Although I wouldn’t liken the manga to a yonkoma, far from it. What I would like to add that it’s originally a web manga, so the quality is appropriate. 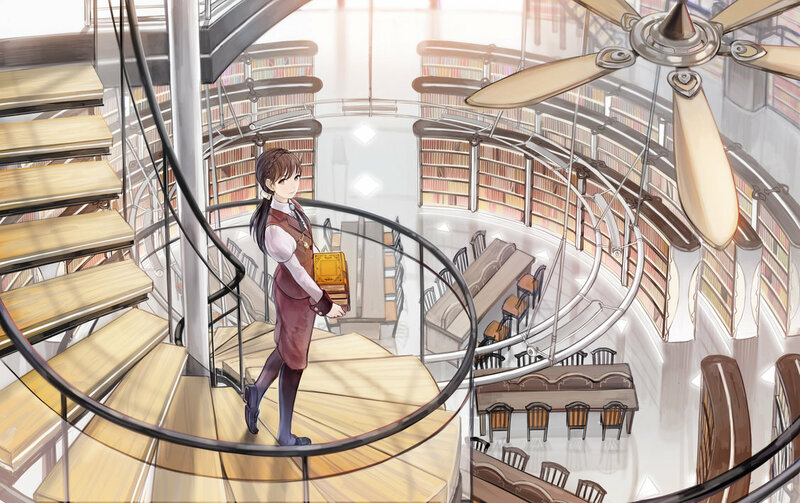 But it’s a nice slice-of-life manga, as s-o-l as it can get in this setting. The vignettes are good food for thought. Yonkoma isn’t right, but does kind of remind me of one. Had no idea it was a web manga, but that would explain a lot, especially the art style.